Montana's two buffalo fishes are both found east of the Divide. They are both large, heavy, deep-bodied fishes with long dorsal fins. They prefer reservoirs and larger rivers. In past years there has been a small commercial fishery for them in Fort Peck Reservoir. The smallmouth buffalo is the smaller of the two. They are generally bottom feeders and are reportedly good to eat, but bony. Bronze to slate or olive on back and sides, often with a bluish cast; lighter below. Fins dark. Top of upper lip is well below margin of eye. Make long spawning movements from lower Missouri River to upstream areas. Dispersal downstream follows. Found in rivers and impoundments in both shallow and deep water over firm bottoms. Spawn in larger streams with backwater areas. Mostly aquatic insects, crustaceans, and mollusks. Some plant material also. Downstream portions of Yellowstone River important as rearing areas. Ft. Peck Reservoir is important rearing area. Sexually mature at 3 yrs. Incubation: 10 days. Eggs laid over bottom or on vegetation. Spawns late May - July on middle Missouri River with peak in mid-June. 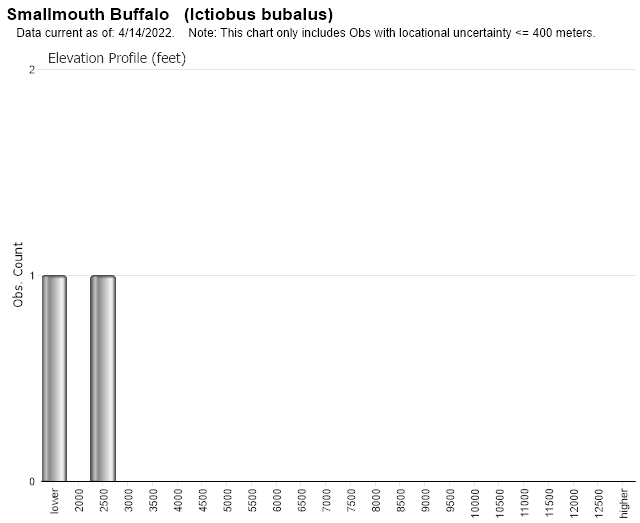 Web Search Engines for Articles on "Smallmouth Buffalo"